It’s the green and leafy end of summer in Massachusetts. Soon the leaves will turn into the glorious autumn of New England. One of its sons, American journalist Francis Moriarty, has returned to his roots, continuing to write and report for among others The Berkshire Eagle in Pittsfield, but also spending more time with his family and friends there. And while we wish him well, Moriarty leaves a big hole in terms of his many years of work for press freedom and the Human Rights Press Awards (HRPA), and his political analysis and news coverage on radio. During the many elections he covered during his time in Hong Kong, both local and within Southeast Asia, Moriarty would talk as a radio journalist for the layman listener. He prided himself on ensuring that issues were well explained. And as I can attest as a presenter on RTHK Radio 3’s evening programme, Newswrap, he was a master at the on-the-spot two-way. “What’s happening at Legco, Francis?” and off he’d go, giving both colour and precise detail, so that even the novice listener understood functional constituencies and “Super Seats”. At press conferences, government ministers and legislators all knew the man who did the RTHK news beat for 19 years. Mike Weeks, FCC member and a senior news producer and presenter of RTHK Radio 3’s morning news programme “Hong Kong Today”, first met Francis Moriarty at Commercial Radio and then would work with him for years often outside or at Legco. “Francis is a great commentator and a great person to have on live. When you sent him along to something, he was the sort of person, when there was a major announcement — the budget, policy address — I’d have Francis down there to ask questions, but also to come on and give his views. “He’d also come on every Monday morning as a political commentator to give his views on what had happened in Hong Kong politics that week and I know from a number of listeners that they found his views interesting and balanced and entertaining. Moriarty with former president Neil Western, Board member Florence de Changy and current president Juliana Liu, following his final meeting as a member of the Press Freedom Committee before he departed for the US. 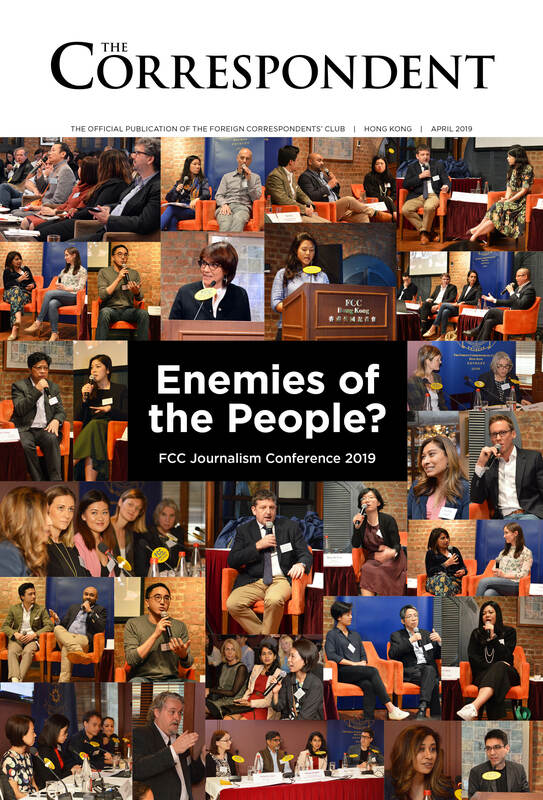 FCC member Joyce Lau, the director of media and communications at NGO Civic Exchange, recalls: “Francis co-founded the Human Rights Press Awards in 1996, during a period of concern about political freedoms leading up to the 1997 handover. This was before my time — but I know he was considered one of the top political commentators who bridged colonial and post-97 Hong Kong. I will always remember how he can really get people to open up, even if they don’t entirely want to. “I met him when I was writing a story about press freedom in Hong Kong — and everyone told me that he was the expert to interview. He became a close friend, and also introduced me to the FCC and the HRPA — two organisations that have become very important to me. Moriarty with former governor Chris Patten and his wife Lavender, and former FCC presidents Chris Slaughter and Kate Dawson. Moriarty’s late father served in the Second World War and the Korean War, before returning to the US and dying at the young age of 44. As the sole surviving son of a veteran, he was not conscripted to fight in Vietnam but became a very vocal opponent of the war. Before his arrival in Hong Kong in 1989, Moriarty covered stories including the assassination of San Francisco gay rights advocate Harvey Milk, a friend; in 1978, the last Israeli-occupied town, Yamit, on the Sinai Peninsula before it was handed over to the Egyptians, when Moriarty was smuggled in a blanket in a Bedouin truck. He worked in Berlin in the late 1980s, and, like something out of a John Le Carré novel, was watched by a man in a trench coat standing under a lamppost. Moriarty arrived in Hong Kong on April 15, 1989, coincidentally the day senior mainland official Hu Yaobang died. He was seen as non-corrupt and his death helped spark the pro-democracy demonstrations that would lead to the Tiananmen massacre. It was the tens of thousands of people standing in silent protest in the pouring rain outside the then-offices of the Xinhua News Agency in solidarity with the demonstrators in Berlin that led to Moriarty’s decision to stay. He would join RTHK in 1995 where he covered some great stories: reporting on 9/11 after accompanying then chief executive Donald Tsang on a trip to the US; and every Philippine election in the post-Marcos era apart from that of the current president Rodrigo Duterte. Moriarty covering post-9/11 on Wall Street. He enjoyed the Legco meetings in its former home, the Old Supreme Court building. He describes how the current building is all about security, whereas previously legislators were much more accessible from where the reporters were sitting. “You could say: ‘Psst Jasper [Tsang Yok-sing], psst Martin [Lee], pssst Emily [Lau]’,” and they would talk to him afterwards. Or the reporters would run round to the exit to catch legislators, or the last governor Chris Patten. While Francis Moriarty is best known within the FCC as co-founder of the Human Rights Press Awards, he had always been a strong advocate for free speech and press freedom issues from the early 1990s. He became the first chairman of the FCC’s Press Freedom Committee in 1995 and remained in that post for many years. For HRPA’s 20th anniversary in 2016, Moriarty wrote about the early days of the Press Freedom Committee and how HRPA came about. “The atmosphere of the Club in the early 90s was not as openly supportive of taking public stands on free speech and free press issues as it is these days. Of course, there have always been individuals, including past presidents and Board members (Associates among them), who’ve bravely stood up for these issues at critical moments. But taking such stands in those pre-handover days could at times be a somewhat lonely proposition. China was already casting a long shadow and Hong Kong’s future was uncertain. Without the security blanket of the departing colonial administration, many individuals were weighing their personal and business interests vis a vis the soon-to-be-incoming order. Moriarty hosting the 17th Human Rights Press Awards which he co-founded. It was in this atmosphere that the idea of the first arose in mid-1994. Moriarty also explained, in part, why he was reluctant initially to carry the idea forward when Robyn Kilpatrick, then chair of Amnesty International Hong Kong, suggested it. “When we met I did not yet know what I would quickly come to realise, that Robyn was not just someone with an idea, but a force of nature. Robyn explained the idea of creating press awards similar to the prestigious awards given by Amnesty in Britain. “I nodded politely while mentally tabulating all the reasons why we should not go near this proposal with a bargepole. Clearly this idea had to be stopped in its tracks. But how? I was beginning to sense Robyn’s determination, which was a little scary.